Glenbrook Dodge Chrysler Jeep® is your trusted Dodge dealership when it comes to new and used cars for sale in Fort Wayne, IN. We carry a full selection of the latest models, and our car dealers are committed to helping you pick out the best vehicle for your needs. If you find yourself in the market for a new minivan, you can’t go wrong with the 2019 Chrysler Pacifica. Versatile, capable, and innovative, this is one vehicle that truly stands out from the competition. To see how it stacks up against some of its top competitors, we created this comparison between the 2019 Chrysler Pacifica and the 2019 Honda Odyssey and 2019 Toyota Sienna. When looking at performance, all three minivans offer generous engine power and capability. However, the Chrysler Pacifica at our Dodge Fort Wayne dealership takes the cake in more ways than one. Its standard 3.5-liter V6 churns out a steady 287 horsepower, to which the Honda Odyssey falls short. The Honda minivan’s standard 3.5-liter V6 delivers a less-powerful 280 horsepower across all trims. 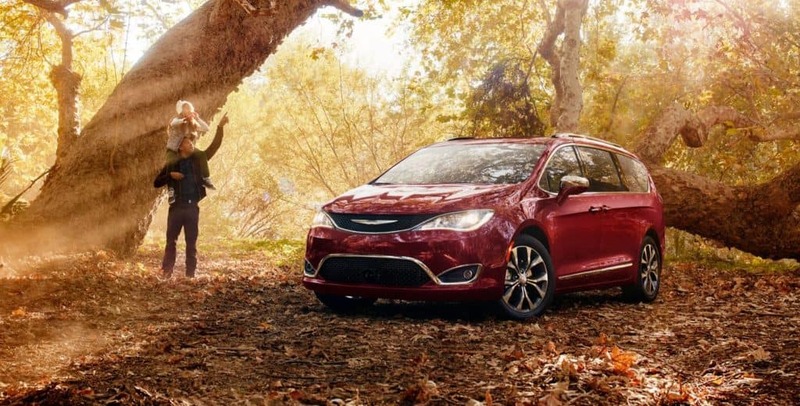 Thanks to the strength found beneath the hood of the Pacifica, it renders a maximum 3,600-lb towing capacity. The Toyota Sienna struggles to keep up, as it features a maximum towing capacity of just 3,500 lb. Minivans are designed to be versatile to fit the ever-changing demands of families on a daily basis. While all three models sport their respective systems, the Chrysler Pacifica offers a bit more by way of flexibility. Thanks to its Stow ‘n Go® seating and storage system, both the second and third row can be folded flat into the floor. The Toyota Sienna and Honda Odyssey only feature in-floor storage for the third row—the second row simply folds flat (for a completely level load floor, it’d have to be manually removed.) To boot, the Chrysler Pacifica boasts a commodious 165 cubic feet of passenger volume, while the Honda Odyssey only provides 163.6 cubic feet of passenger room. Regardless of which minivan you opt for, each truly delivers when it comes to technology. However, the Chrysler Pacifica near Warsaw, IN adds a couple additional elements for your convenience. Offered as available in the Chrysler minivan, the bird’s eye view monitor renders a 360-degree view of the minivan, creating easier maneuverability in congested situations. The Honda Odyssey fails to offer such a system. Thanks to the available foot-activated liftgate in the Pacifica, accessing your cargo area is as easy as ever. You won’t find this functional system in any trim of the Toyota Sienna. If you’re looking to buy a modern minivan that checks every box, look no further than the Chrysler Pacifica. Come by our Jeep dealership serving Auburn, IN to take it for a spin today! Our RAM car dealers are located at 100 W Coliseum Blvd and look forward to working with you soon.